Today is Texas Independence Day. This time last year after posting a photo of the Alamo somewhere, I was informed that there was, in fact, an Alamo replica right here in DFW. 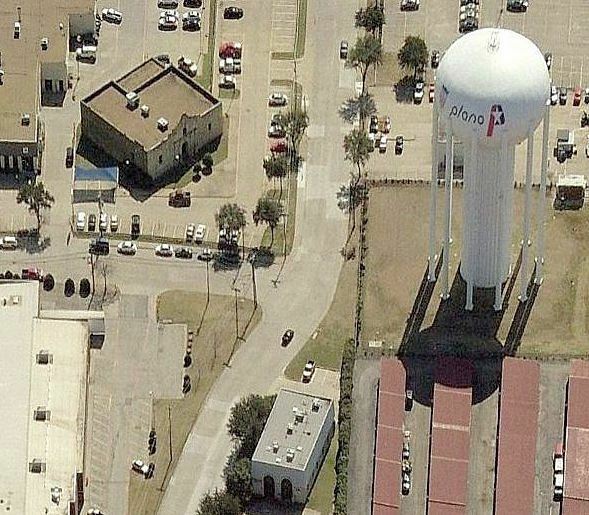 I knew about the one(s) in Fair Park, but Plano? Yep, near 75 and Parker Road, at the corner of Lexington and Premier, just west of the highway. See a southward-looking aerial view on Google here; below is the same view, from Bing. So, um, why is that there? Not being up on my Plano history, and never having been aware of this, it took me a long time to find anything about it. Which is pretty surprising, because you’d think there would be all SORTS of articles about a very large replica of one of the most famous structures in the world (yes, I’m going to say “in the world”), standing right here in the Metroplex. And it’s been standing here for at least 35 years! 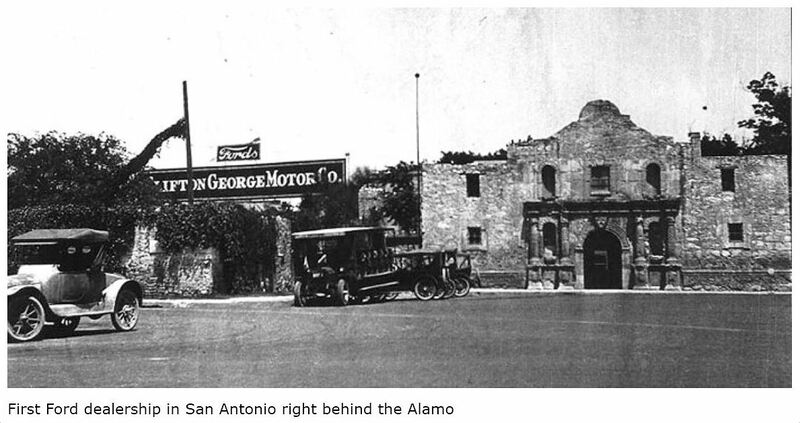 I managed to find a couple of ads and an article about the building — it had started out as an arcade called the Alamo Fun Center and later became part of a car dealership — but I could never find out who built it or why. I thought I’d come back to it in a year — so I could post it on Texas Independence Day — and see if I could find more, looking with fresh eyes. So I tackled it again today, and, glory be, I’ve just discovered that Rick Saigling wrote a piece for Plano Magazine last November titled “Remember the Alamo Fun Center” which answered all of my questions (and had photos of the building when it was new). The Plano Alamo was built in 1982 by brothers-in-law Nathan White and Gene Cason and other investors as a “fun center” to house a Texas-themed arcade featuring video games, miniature golf, etc. While popular with Plano kids, the Alamo Fun Center was not a successful venture, and it shut its ornately carved doors after only a relatively short time in business. There you have it. Thank you, Rick. I now have closure. The earliest (only?) mention I found of the “Fun Center” was the ad below, which appeared in The Wylie News a short time before its grand opening in the summer of 1982. 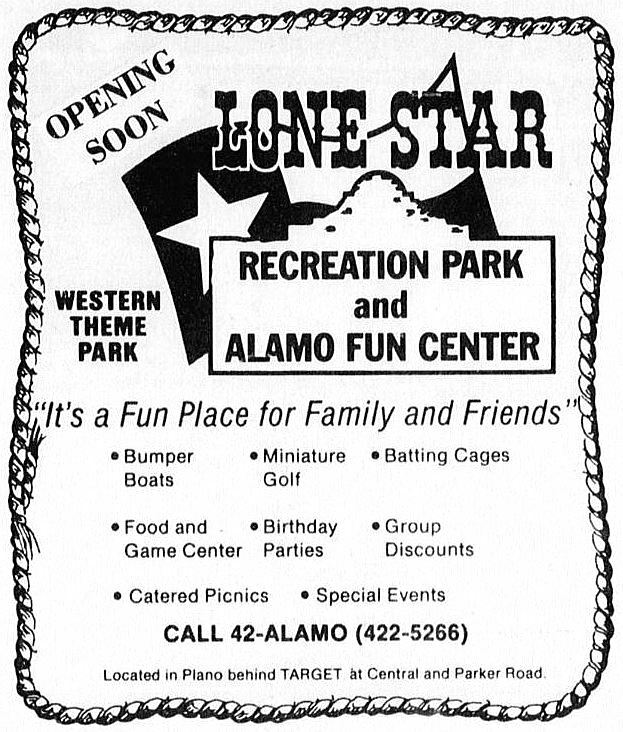 The ad seems to indicate that the name of this “western theme park” is Lone Star Recreation Park and Alamo Fun Center (click to see a larger image). 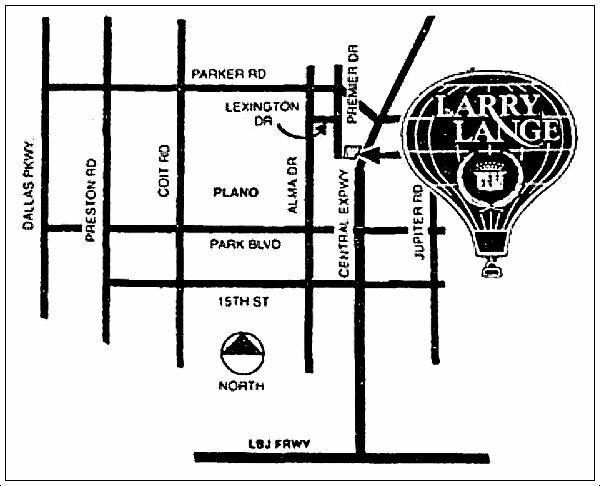 A few months after the Alamo Fun Center opened, Larry Lange Cadillac moved to its new location on the adjacent property. 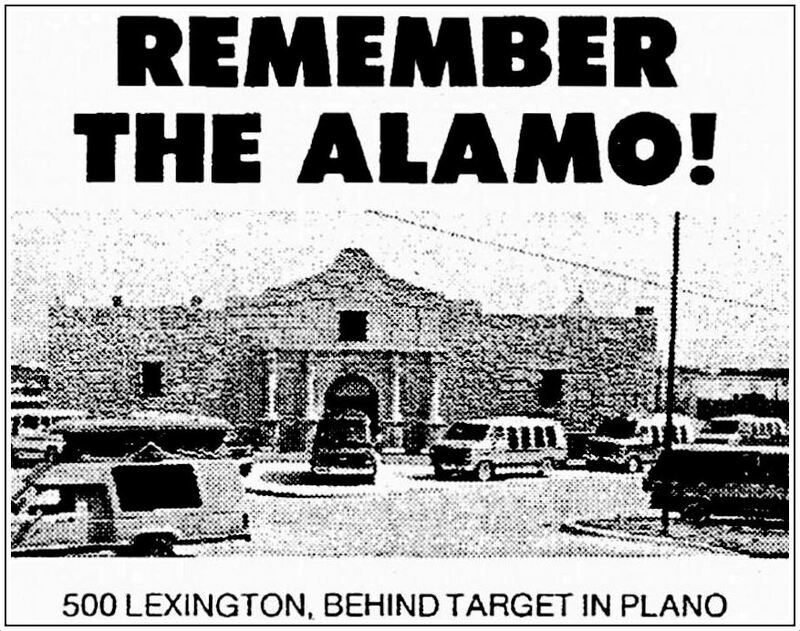 I’m not sure exactly when it closed, but the Plano Alamo was taken by the advancing forces of Larry Lange Cadillac in 1983 or 1984. For whatever reason, the building remained (what Texan is going to demolish the Alamo?) and was incorporated into the Larry Lange business plan. 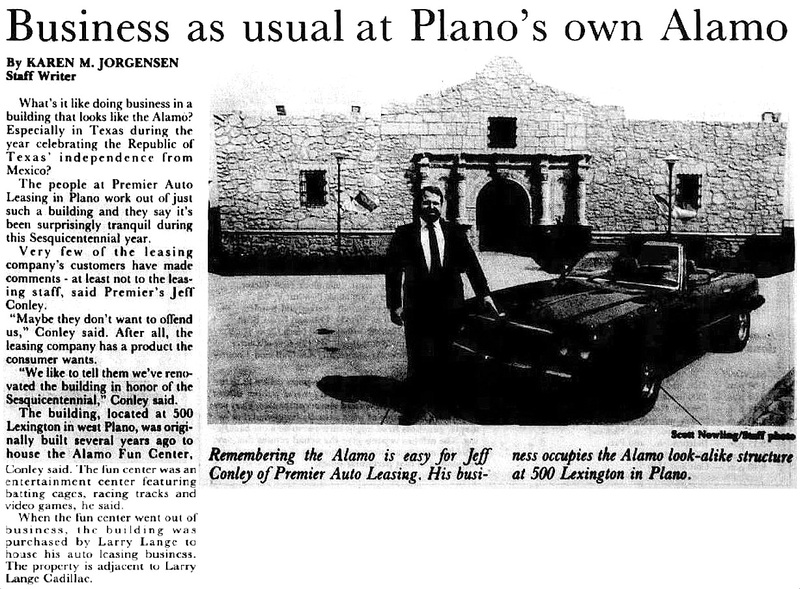 Two years later, in 1986 — the year of the Texas Sesquicentennial — The Plano Star Courier checked in with the then-current occupants of the hometown Alamo, Premier Auto Leasing, to see what it was like working in the Alamo. In Plano. 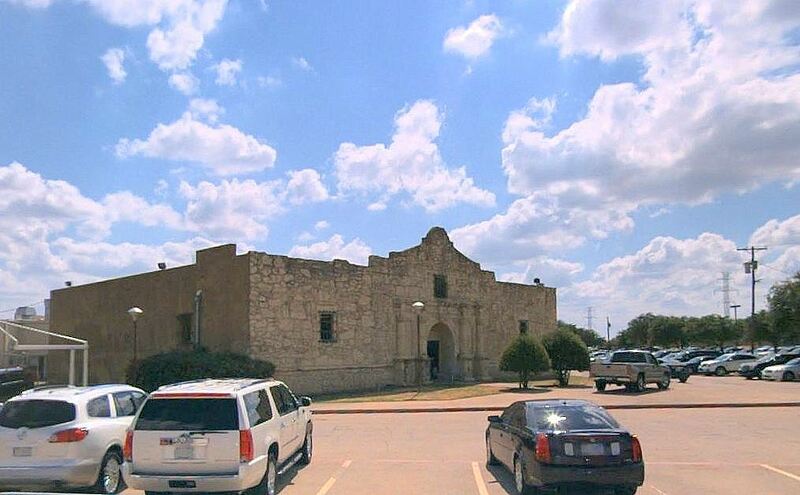 An employee made the impossible-to-believe statement that very few people ever actually commented on the fact that they were leasing their vehicle from a company that occupied a building shaped like the Alamo. In 1999, Diane Jennings of The Dallas Morning News wrote a story on “mock Alamos” around the state. She checked in on the Plano location, then owned by Crest Cadillac, and found it was being used as a warehouse. The general manager, Michael Coston, was not a fan of the building for several reasons, not least of which was the replica’s design. Today Crest Cadillac appears to have forsaken Plano for Frisco, but the property is still in the Crest auto family — it’s now occupied by Crest Volvo. But what of The Alamo? It’s now the home of Crest Collision, a body shop. So there you have it, the story of Plano’s Alamo. 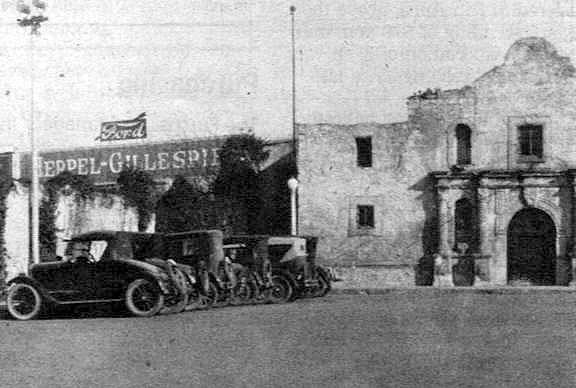 Instead of rushing out to get a Mirabeau B. Lamar tattoo to show my Texan-ness in these waning hours of Texas Independence Day, I’ve decided instead to post a few photos of the real Alamo, which, strangely enough, was also a neighbor to a car dealership, the Clifton George Ford Motor Co. Remember the Model-T! Top ad from May, 1984. Second-from-last photo by an unidentified photographer, circa 1918, from the E. O. (Eugene Omar) Goldbeck Photography Collection, Harry Ransom Center, The University of Texas at Austin; more information and a larger image may be found here. Photos and clippings are larger when clicked. thank you for starting this website. I had always hoped that Dallas would have its own site like “forgotten ny”. I have been going through your articles for days now. It’s wonderful.